A corpus and usage based approach to Ancient Greek. Conference in Riga, Latvia. 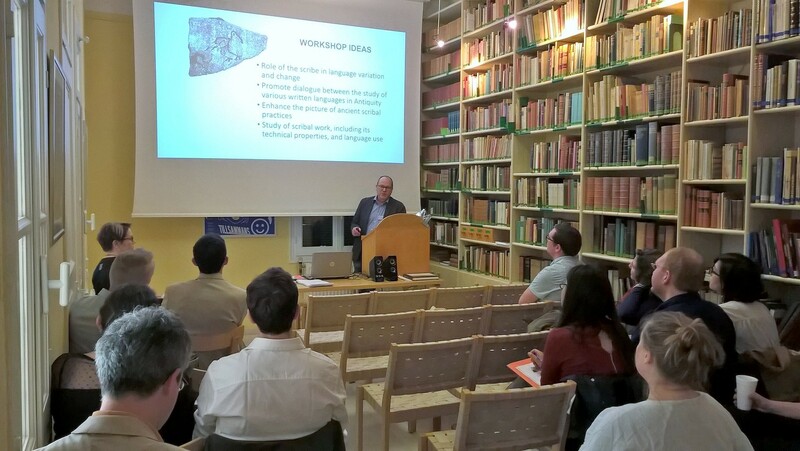 Our team was invited to a very interesting conference “A corpus and usage-based approach to Ancient Greek: from the Archaic period until the Koiné” (April 12-14, 2018). It was held in Riga, Latvia, just an hour flight from Helsinki. The three of us held a joint plenary talk: Martti Leiwo, Sonja Dahlgren and Marja Vierros, “Synchronic and diachronic variation as seen through documentary papyri”. The programme as a whole was delightfully full of interesting talks and the atmosphere was most enjoyable. Weather and the medieval old city of Riga were not bad either. 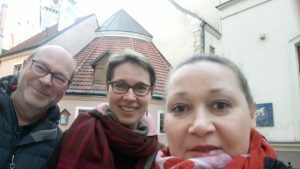 We do hope that the organising team Rafiyenko, Seržant & Crellin will keep on arranging such fascinating academic events! The meeting language will be English (unless there are only Finns present). We will meet approximately once a month on Wednesdays. You are all warmly welcome to attend! Do also feel free to pass on the information to anyone who might be interested. 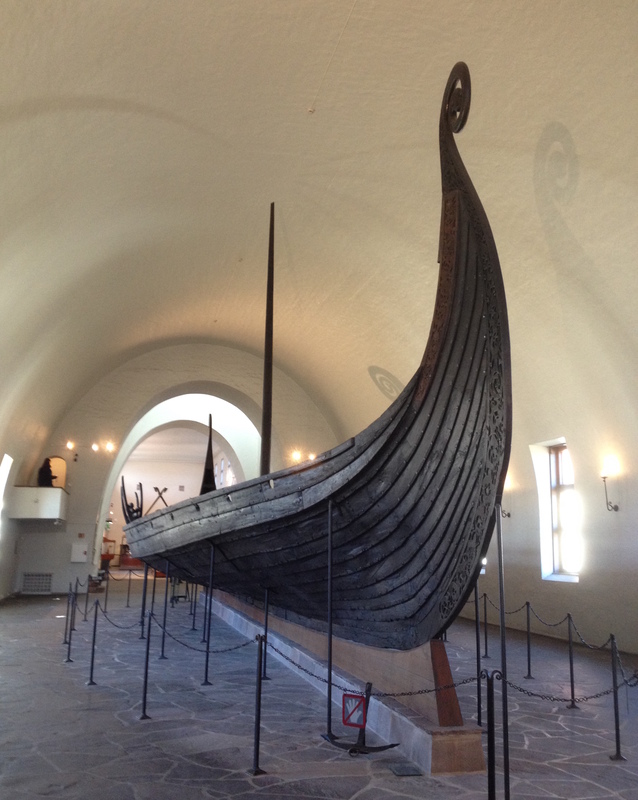 If you wish to join the e-mail list, send a message to Sonja Dahlgren. Ostia inv. 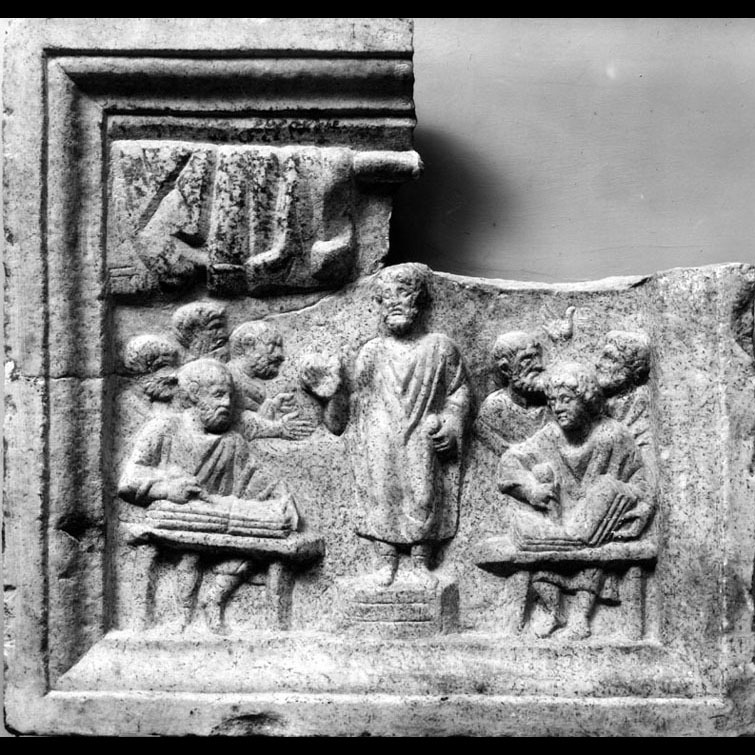 130: Relief of an orator (perhaps a Christian teacher), scribes and an audience. Found in a late-antique room near the Tempio di Ercole (I,XV,5). Guida p. 82-83 nr. 13. Museo Ostiense. Inv. 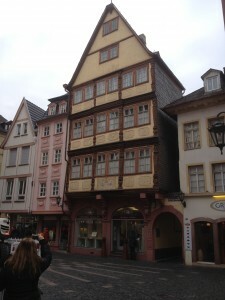 130. Late fourth century AD. The whole group in the courtyard of the Finnish Institute. Photo: Vesa Vahtikari. Our project’s workshop “Interfaces between scribal work and language use” was held in sunny Athens full of spring flowers (and their scent!) in April 6-8, 2017. The venue was the small but lovely Finnish Institute at Athens in the shadow of the Acropolis. The program and the abstracts can be accessed through the Workshop page. Here is our description of the sessions and other happenings. Martti Leiwo’s welcome words. Photo: Vesa Vahtikari. 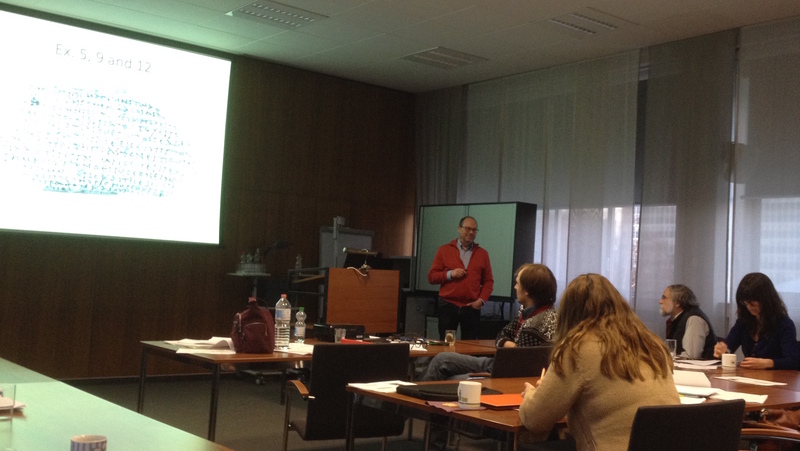 Prof. Andreas Willi. Photo: Sonja Dahlgren. We started on Thursday afternoon with two sessions. The first one concentrated on Latin texts and the difficulties of spelling. Andreas Willi (Oxford) presented the case of carmen Arvale, a cult song by the Arval priests preserved in an inscription from 218 A.D. A stonecutter with limited linguistic skills had had difficulties in interpreting some of the unclassical features of the song due to the difficult Latin cursive script used in his model and this mix-up has cheated later scholars in believing that the inscription represents odd archaic forms of the religious language. Lower levels of literacy and how education reflects in nonstandard spelling was the focus also in Nicholas Zair’s (Cambridge) and Timo Korkiakangas’ (Oslo) talks, but from different angles: Zair’s focus was archaic spellings as signs of educated writers in inscription material, and Korkiakangas presented large statistic studies on Late Latin Charters (714–897 A.D.) where over 200 scribes’ spellings show that the spelling correctness increased by time, in contrast to the expectations. Nick Zair and Greek in Italy plug. Photo. Vesa Vahtikari. The second session took us to Egypt and Greek (and bilingual) texts. Martti Leiwo (Helsinki) gave a description of the use of Greek in the Egyptian Desert in the Roman praesidia. He proposed an “ostraca variety” of the language written on potsherds in these peculiar circumstances. Interestingly, many letters concerned prostitution and in most cases the writer was not a professional scribe. Joanne Stolk (Ghent) discussed the whole corpus of Greek papyri and the corrections that the writers themselves had made in the papyri. It is interesting to see what they saw worthwhile to correct and in what types of documents. 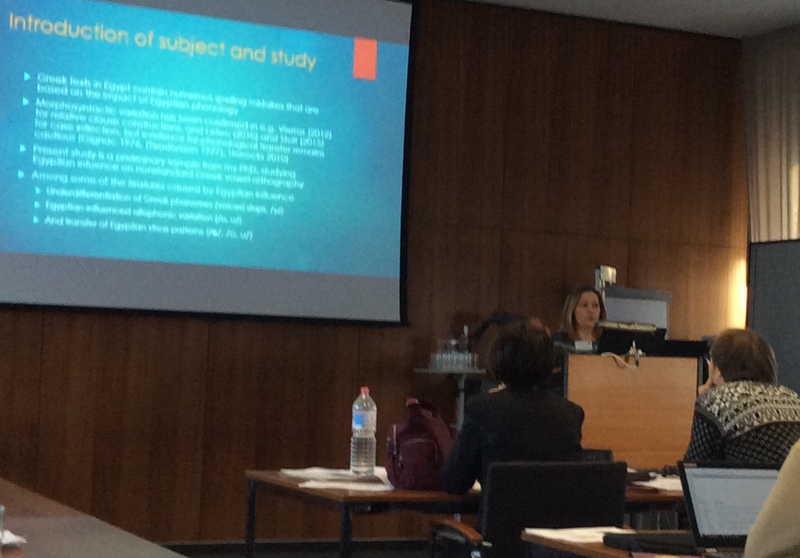 Victoria Fendel (Oxford) presented examples from bilingual (Coptic-Greek) letters discussing contact-induced variation in their formulae, idiomatic expressions and collocations. Reception in the courtyard of the institute. Photo: Marja Vierros. 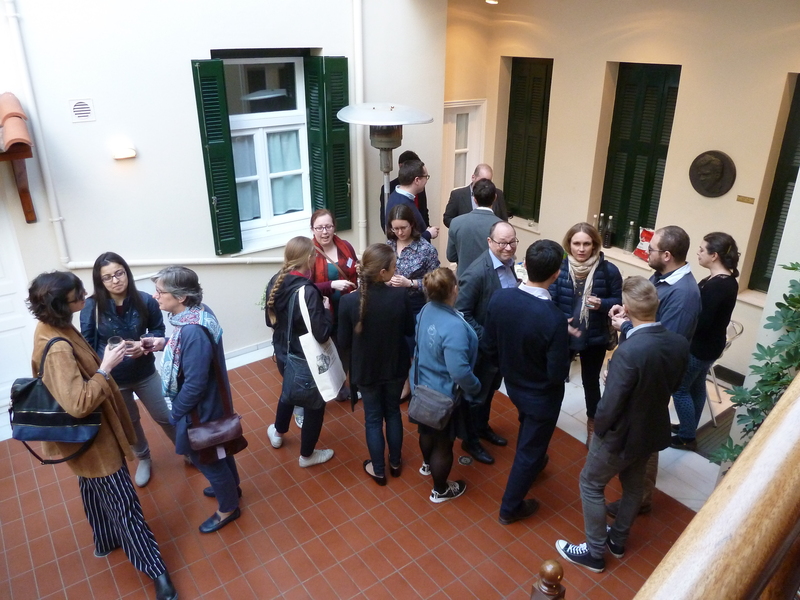 Thursday ended in a reception in the courtyard of the institute in the warm(ish) evening with wine/juice, nibbles, and joyful discussions. Part of the group also ended up for dinner in a near-by taverna where we heard splendid rebetika played by the owner and his friends. Our PI almost had to perform himself. Friday morning found us no less sunny than the previous night, and strengthened by the morning cup of coffee we carried on with interesting presentations such as the possible existence of graphic Koine in Late Antiquity by Arianna Gullo (Durham), that is, how we can see the letter forms transferring over the language boundaries. The second speaker of the day, Tommaso Mari (Bamberg) talked to us about the transcripts taken by notaries in the Council of Chalcedon (451), and whether they indeed were verbatim as alleged. The main questions are: what can be said about the spoken level of language in this context of scribal work, how much did scribes’ work interfere with it, and what was the linguistic output of the scribes in terms of translation and bureaucratic conventions? Last, but not least, Anastasia Maravela (Oslo) and Nicola Reggiani (Parma) introduced the corpus of medical papyri they have explored and digitized in the ERC project DIGMEDTEXT (Parma). They have analysed their linguistic variation in terms of language choice, document format and handwriting. The second session of the day started with Klaas Bentein (Ghent) presenting his theory of applying multimodality to the study of variation in the documentary texts in the Nepheros archive. Next, Carla Bruno (Siena) talked about the infinitives in Ptolemaic Greek papyri, introducing the scope of variation that marked the decline of the infinitive in the Post-Classical Greek verb system. Last in the session, Marja Vierros talked about how modern authorship attribution methods could be applied to the study of papyrological material to be able to better determine who actually wrote the texts, the scribe (or an acquaintance of the sender of the message), or perhaps the author himself. Prof. Sebastian Richter. Photo: Marja Vierros. The third session took us to the land of Coptology. Jenny Cromwell (Copenhagen) started with an insight to palaeography through the study of early Islamic Coptic and bilingual Coptic-Greek administrative texts in Egypt. If the same kind of handwriting, and usage of new terminology, can be seen in two sites with a substantial geographic distance, how reliable evidence can handwriting styles really be in determining individual authors, and dating? Sebastian Richter (Berlin) presented us with an equally fascinating subject on Coptic legal documents through looking at P.Budge, one of the earliest legal documents in Coptic, with a question on who exactly was responsible for the vivid language use – was the scribe faithfully recording the original sociolinguistic registers, or was the scribe narrating these? The session was ended by Sonja Dahlgren presenting some of her findings on a possible Egyptian Greek variety, based on Ohala’s (1981) phonological theory of listener perception, a frequent phenomenon in language contact situations. 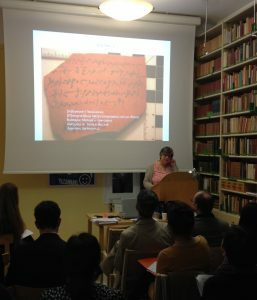 Ruth Duttenhöfer talking about ostraca. Photo: Marja Vierros. The fourth and last session on Friday contained papers on ostraca and papyrus archives. Ruth Duttenhöfer presented exciting material from Roman poll tax receipts from Elephantine where short and formulaic texts are filled with much interesting orthographic and linguistic variation (in how many ways can one (mis)spell laografia?). Elizabeth Buchanan (Ohio, Findlay) talked about Greek and Coptic debt acknowledgements in the archive of Dioscorus of Aphrodito, concentrating on dating of documents and the transition between forms and different languages (Greek and later Coptic) used in their composition. In the last paper Anna Arpaia (Florence) presented her work on the evolving functions and role of the notaries known as agoranomoi, who worked both as public scribes and editors of documents. Gathering in front of the Institute, heading towards dinner. Photo: Sonja Dahlgren. Workshop dinner. Photo: Marja Vierros. MariaChiara Scappaticcio early on Saturday morning. Photo: Sonja Dahlgren. MariaChiara Scappaticcio’s paper on Saturday morning discussed the papyrus P.Amh. II 26 (III-IV AD). This papyrus contains three fables of Babrius with a Latin translation, which shows many mistakes and unidiomatic uses. The text was used in a language learning environment and the paper discussed the possibility that the translation was in fact made by the scribe who wrote the papyrus. Elena Martin González discussed the Greek inscriptions of Roman Macedonia. These texts show unmistakably Roman practices in their use of punctuation and abbreviations, making it possible to observe the transition of epigraphical and scribal practices across the language boundary. The third paper was given by Hilla Halla-aho. Her paper addressed the level of learning and writing of those scribes who wrote wills and birth certificates in Latin in Roman Egypt. The second session on Saturday took us several centuries back in time. First Anna Novokhatko discussed terminology used of writing and writing equipment in classical Greek texts. In the 5th century BCE it is possible to discern the increasing role of scribal activity and its impact on the society in especially dramatic texts. Anna Judson’s paper concerned scribes and orthographic variation in the linear-B tablets of Pylos. She concentrated on different types of orthographic variation which are found and their distribution amongst scribes working in different areas of the administration, raising the possibility of different spellings being ‘standard’ amongst different groups of scribes. Artermis Karnava’s paper focused on the bilingual and digraphic writing in the epigraphical evidence from Cyprus, paying special attention to inscriptions with digraphic evidence (Cypriot syllabic vs. Phoenician, Cypriot syllabic vs. Greek alphabetic) or bilingual evidence (Greek vs. ’Eteocypriot’). Discussion after Giuditta Mirizio’s paper. Chair Sonja Dahlgren. Photo: Marja Vierros. 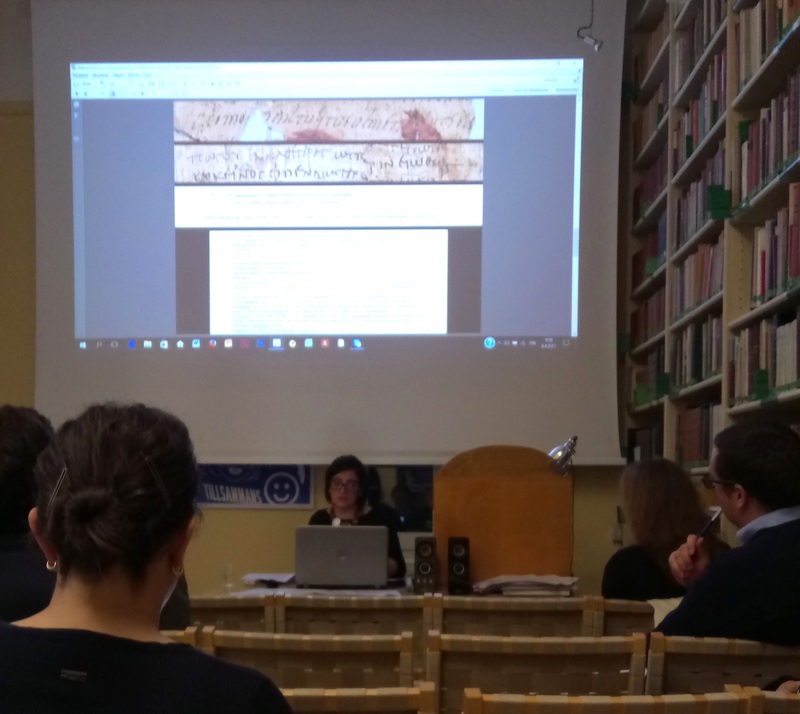 In the third session, Giuditta Mirizio talked about different types and meanings of texts labelled “copies” in Greek documents, pointing out that the term “copy” may encompass a wide variety of activities and terms, including e.g. a mention of an existing copy in a document, or a copy of another text enclosed e.g. in a letter, or a fully-fledged official copy. 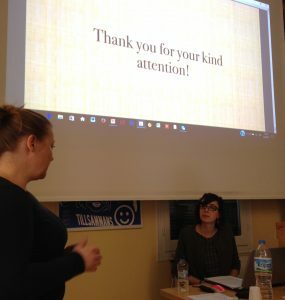 The final speaker of the workshop was Mariarosaria Zinzi who discussed graphic and linguistic variation in private letters written (or sent) by women in Roman Egypt, focusing on connections between linguistic change, the scribal practice and the sender’s literacy. 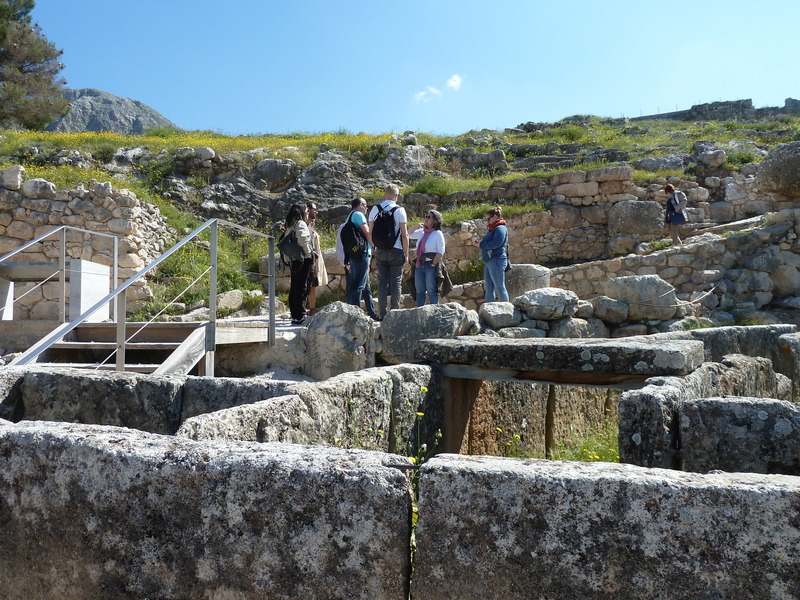 Having said farewell to those participants who left after the official program ended on Saturday, a small group of us entered a bus on Sunday morning and set out to explore Mycenae. At the site we were introduced to the exceptional history and archaeological remains by Martti Leiwo and our pop-up guide Artermis Karnava. Afterwards we had lunch in Nafplio before returning to Athens. 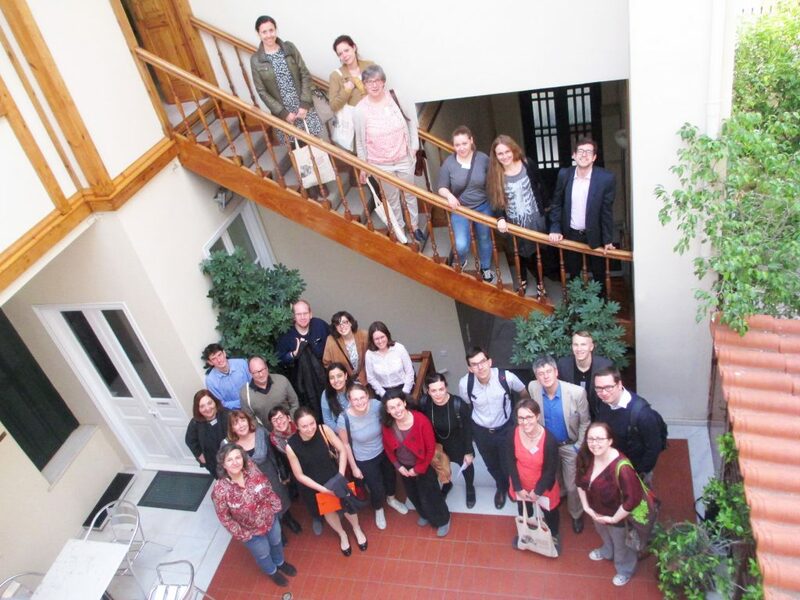 We wish to thank all participants for a vivid and inspiring workshop! 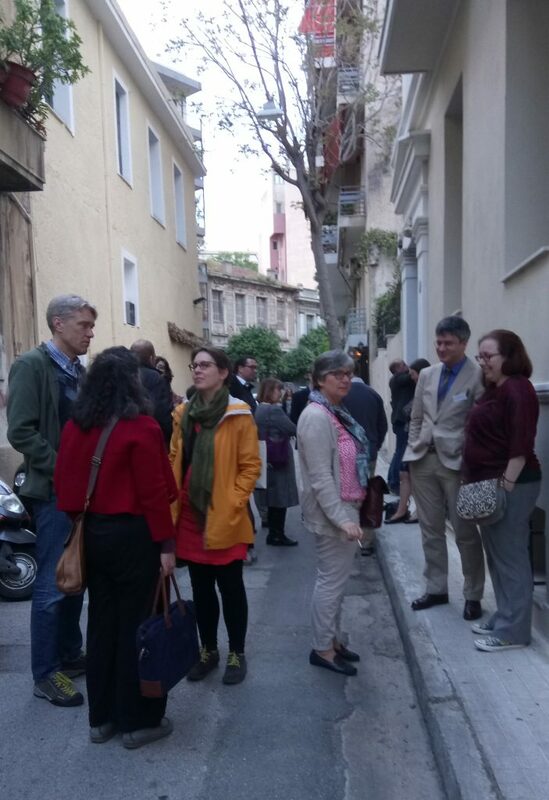 Our warmest thanks also to Vesa Vahtikari, the assistant director of the Finnish Institute at Athens, and to other members of the staff in the Institute for all their help during the workshop! One of the nice sides of being an academic is travelling to nice places to meet people you only know as authors of interesting articles or books you have read. And you get to spend some days discussing with them and finding out how nice they all are. 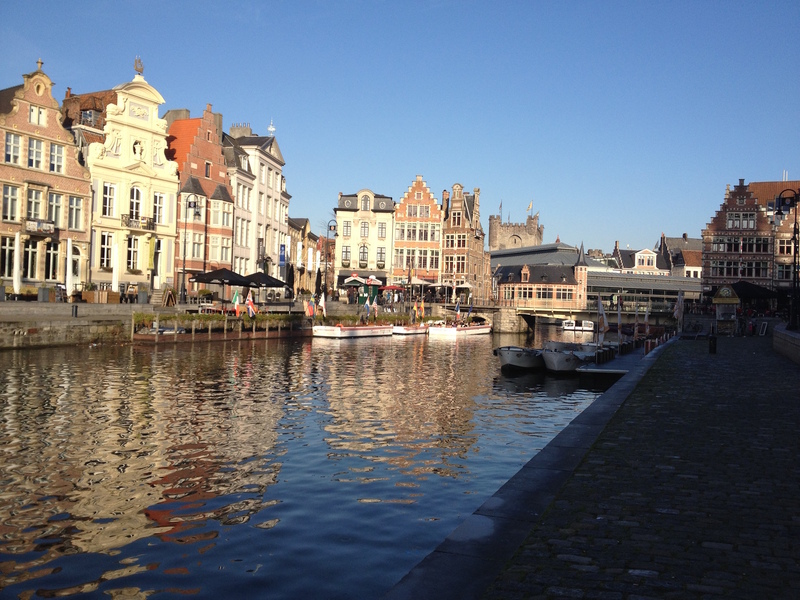 For the two first days of December me and Martti travelled to the beautiful city of Ghent in Belgium for a conference titled Varieties of Post-Classical and Byzantine Greek. 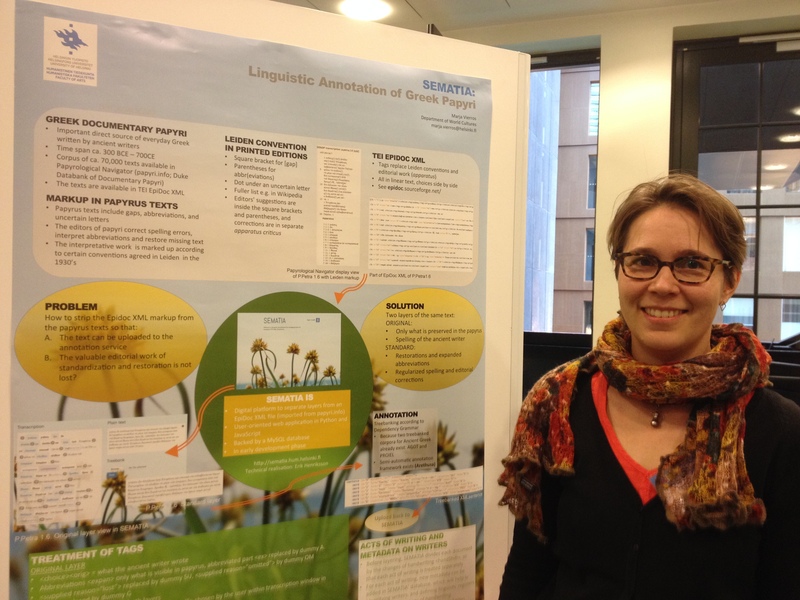 The program contained an interesting variety (hah-hah) of topics with quite broad choronological scope. Surprisingly many papers used papyri as their source material; this trend has been rising among Ancient Greek linguists recently, we are happy to note. 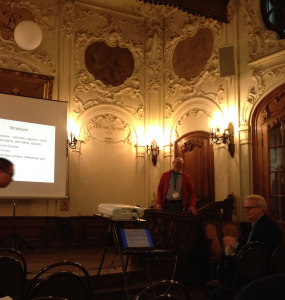 Our PI, Martti Leiwo, gave the first plenary lecture titled Tracking down (-)lects in Roman Egypt. After that, we heard shorter papers on tense forms, directives, metrical and syntactic variation and lexicographers. 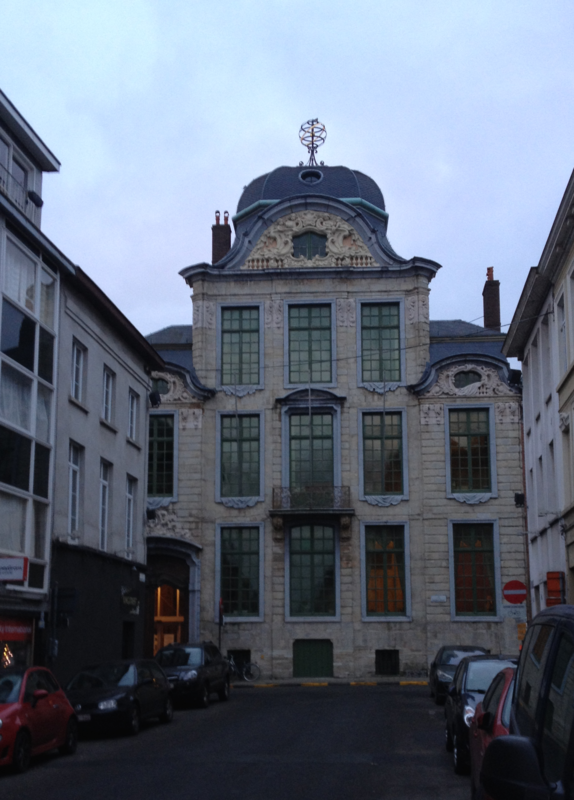 My paper, Idiolect in focus: brothers in the Memphis Serapeion, wrapped up the first day of sitting down and listening each other in the handsome Rococo building of Koninklijke Academie voor Nederlandse Taal- en Letterkunde. The evening continued more informally with reception and dinner (both very fancy, though!). The second day was no less interesting. It began with Geoffrey Horrocks’ plenary lecture Byzantine literature in “classical” genres: the underlying grammatical realities and continued with papers many of which discussed text types and dialects as well as register. Lastly we heard about language of religion. In sum, very many different -lects were covered, and they obviously need further study. In order to carry out this task, we are happy that one of the organisers, Mark Janse, reminded us about the most important -lect, the intellect! 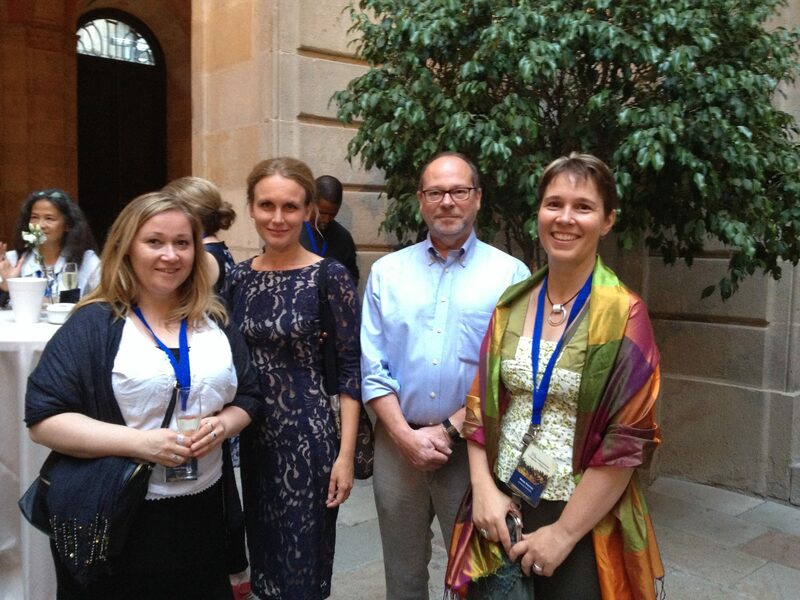 All four of us attended the 28th International Congress of Papyrology in Barcelona . Personally, I must admit that I had serious doubts concerning the prospects of the event. Due to expected tourist crowds and heat, as well as a previous chaotic conference experience in the same city years ago, I was less than anxious when packing my suitcase. But to be sure, I was eager to meet the papyrological community, as it was the first time ever for me in this conference. Fortunately, all my fears turned out to be ill-founded. 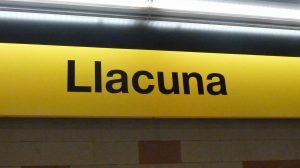 I’m sure there were tourist crowds somewhere, but they were not in the vicinity of the Universitat Pompeu Fabra where the conference was admirably hosted by Alberto Nodar and Sofía Torallas. It was warm, at places very warm for a northerner, but no unbearable heat at all, and there was a lovely breeze from the Mediterranean. 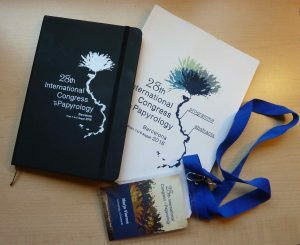 The conference was very well organized, with an excellent venue, good program, strict timetables, and nice social events. Most importantly, I learned a thousand new things about papyri and papyrology. From a comparative perspective I might add that there were generally less comments after the papers than in some other conferences where I am used to going, but they were on the whole more pertinent. Everybody appeared to keep the discussion very tightly on the topic. Always a good thing! 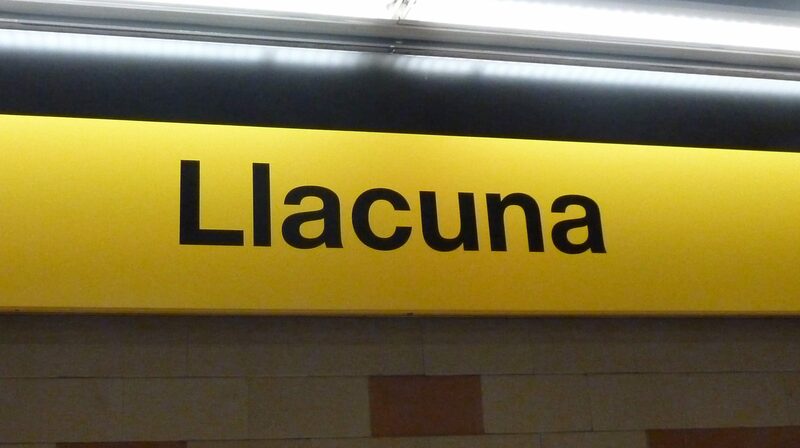 Our metro station – well suited for papyrologists! 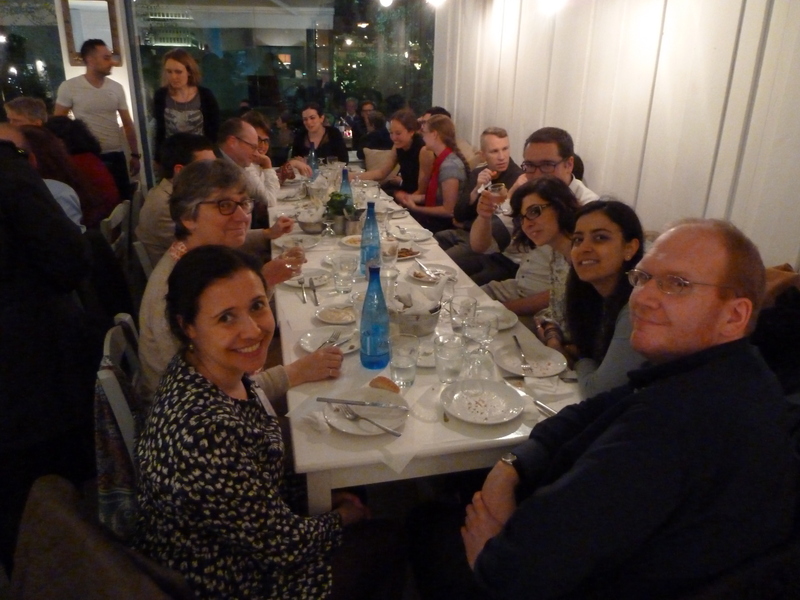 On the whole, our team truly enjoyed the event, both scholarly as well as otherwise (including the sea and amazing beaches!). Some of us even went to see sights, such as the world-famous cathedral Sagrada Familia. Martti introduced our project: “Act of the Scribe: Transmitting Linguistic Knowledge and Scribal Practices in Graeco-Roman Antiquity”. Marja presented the Sematia database, which she has created and developed: “Sematia platform, linguistic annotation and the katochoi of the Serapeion”. Prezi. Sonja talked about some of the results of her Ph.D. project on Egyptian influence in Greek: “Evidence from the papyri: a preliminary definition of an Egyptian Greek variant in Graeco-Roman Antiquity”. Hilla presented an unpublished Latin text: “An unpublished Latin testament (P. Carlsberg 671 recto + P. Berlin 14470b recto)”. Handout. Slides. We invite interested scholars to submit abstracts (max. 500 words) by October 31, 2016 at the latest (actofscribe-athens2017 [at] helsinki.fi). Presentations are expected to be 20 minutes followed by 10 minutes of discussion and the preferred language is English. Topics that are of interest to the workshop include, but are not limited to, e.g. 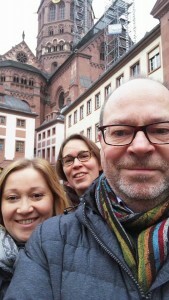 Another post for the “better late than never” category – the project received a partner project visitor when Professor James Clackson (University of Cambridge, Classics and Comparative Philology) came to Helsinki to give a lecture (April 21st 2016). Prof. Clackson is famous and well known for many, many things (see better here), but for our project, the main interest lies in his study of language contacts, and especially the long-term effect of these. 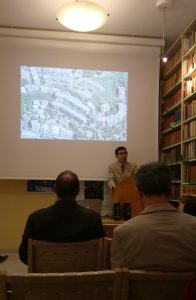 James runs a project called Greek in Italy at the University of Cambridge. The project studies the contact effects between Greek and languages of Ancient Italy, among others the Sabellian language group. You can read more about the project and the other participants here. In the project James concentrates on the early history of Latin and the treatment of Greek loanwords in it, compared with how they were treated in other Italic languages. The title of his presentation was Greek Loans in Italy, and it gave us a fascinating glimpse into e.g. some very interesting new etymologies in Etruscan, as well as an introduction to the situation and amount of Greek loanwords in other Italic languages compared with Latin. Afterwards, there was dinner and drinks. Good times! 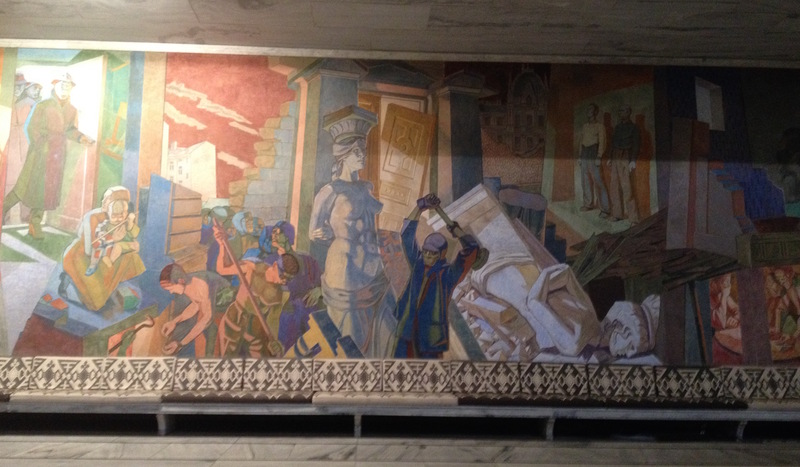 Reception of DHN conference at the Oslo City Hall. Interesting murals were all over the place. This post belongs to the category ”better late than never”. In 8th of March, 2016, we were happy to host a guest lecture by Dr. Joanne Vera Stolk, who came to visit Helsinki from Oslo. Joanne defended her PhD thesis Case variation in Greek papyri. Retracing dative case syncretism in the language of the Greek documentary papyri and ostraca from Egypt (300 BCE – 800 CE) in late 2015 at Oslo University, so you can guess that we find her studies very relevant in our project. If the standard is difficult to define, how could we define a mistake? Joanne’s lecture was titled: ”How to use the dative case? Editorial regularizations in Greek documentary papyri.” She presented interesting examples on how an editor of a papyrus text may suggest that we should read, e.g., a dative instead of an accusative in one place, and another editor may suggest an opposite regularization in a similar place in a different text. Many such examples need of course careful analysis as respect to date and location, but they also offer interesting views on the fluctuating nature of ”standard” which the editors follow (or create). If half of the private letters from the fourth century use accusative in the health wishes and half use the dative, should we still consider the other one as ”standard”? All this is naturally highly important when one tries to trace so-called scribal mistakes. If the standard is difficult to define, how could we define a mistake? Therefore, the editorial regularizations are not to be taken at face value, but as signs of grammatical patterns where variation occurs and are thus worthy of further study. The disappearance of the dative case from Ancient Greek is par excellence one such development where fluctuation between dative and other cases need to be analyzed very carefully. The preconference workshop ”Digital Classics. A hands-on Introduction to EpiDoc and Treebanking” organized by Federico Aurora was especially rewarding for us. In the same evening we enjoyed a guest lecture by Gabriel Bodard (ICLS) on Digital Classics and the generous hospitality of the Classics department. 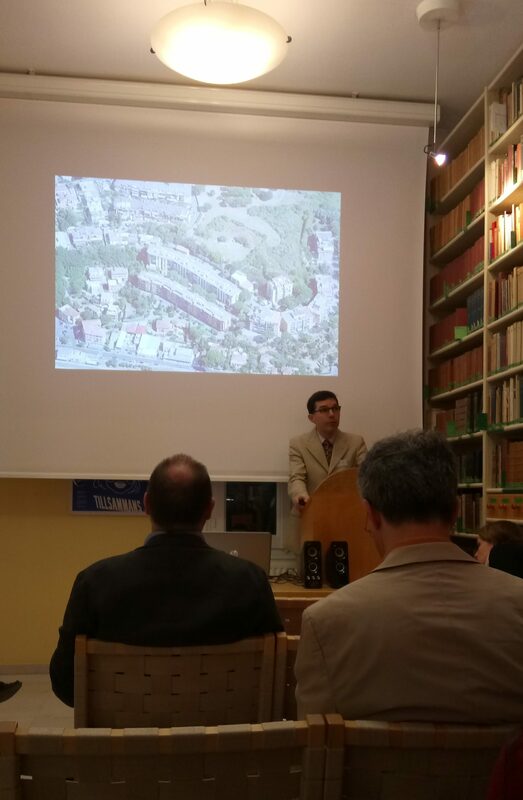 On Friday I was invited to give a working paper at the papyrology seminar. Thanks to the small but spunky group of papyrologists at Oslo (Anastasia Maravela, Joanne, Federico et al.) for inviting me and listening my thoughts on copies and drafts in papyri after a night of suffering from fever and sore throat. All in all, great two weeks! Oseberg ship at the Viking ship museum. Worth visiting! Three quarters of our project travelled to Mainz, Germany, in February 2016 for a conference with the promising title you see above. The full programme can be found on this website. We enjoyed our three days there immensely. Big thanks to the organisers! Everything rolled smoothly and schedule was well obeyed. 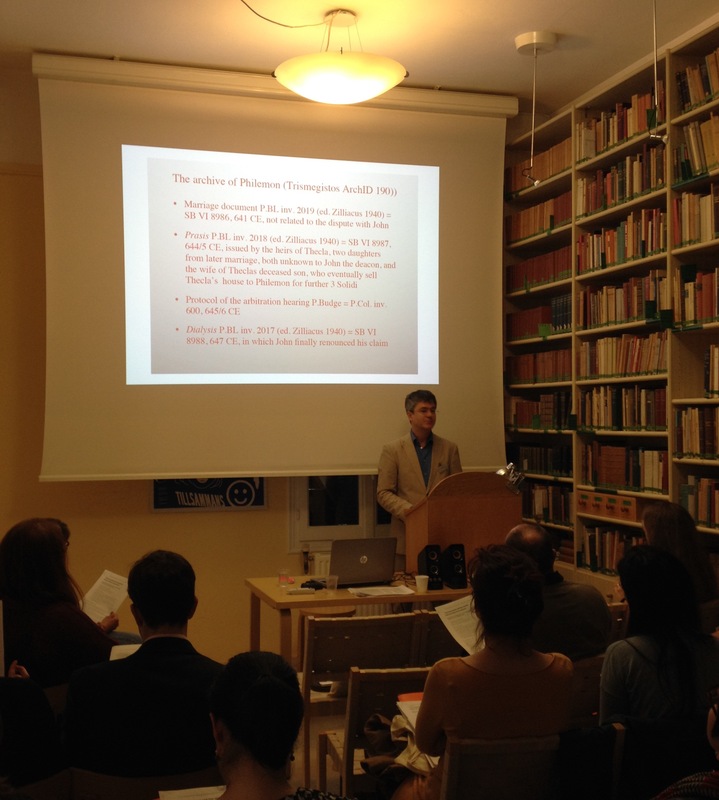 In the introductory lecture, Dariya Rafiyenko and Ilja A. Seržant led us through many features of postclassical Greek. They pointed out the ongoing need for further studies on the subject, especially of the kind where linguistic and philologic knowledge meet. They also presented the term ”doculect” to illustrate that our documentary source material can be treated as a ”lect” of its own. 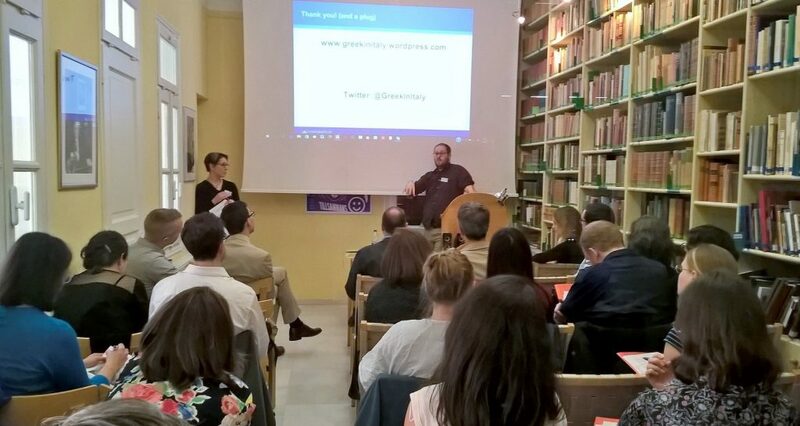 We had already noticed with satisfaction that many papers of the conference made use of documentary papyri and ostraca as their source material. The term ”doculect”, however, made us Finns giggle. In Finnish, docus indeed have a lect of their own, because ”doku” is a person whose main pastime is alcohol consumption. This unhappy lexical clash will not prevent us from making the best use of the term in the future (both in Finnish and in English)! 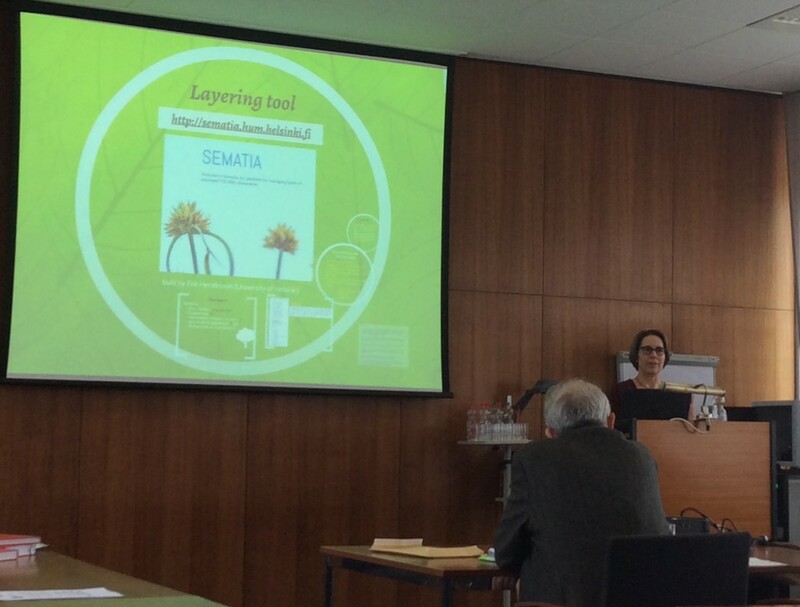 Our project got a good head start as Marja Vierros presented the project and the ”Sematia” platform in the first morning session with the title ”Linguistic Annotation of Greek Papyri”. The Sematia tool also received an ad hoc demonstration by Marja the following day at the end of a long lunch break. 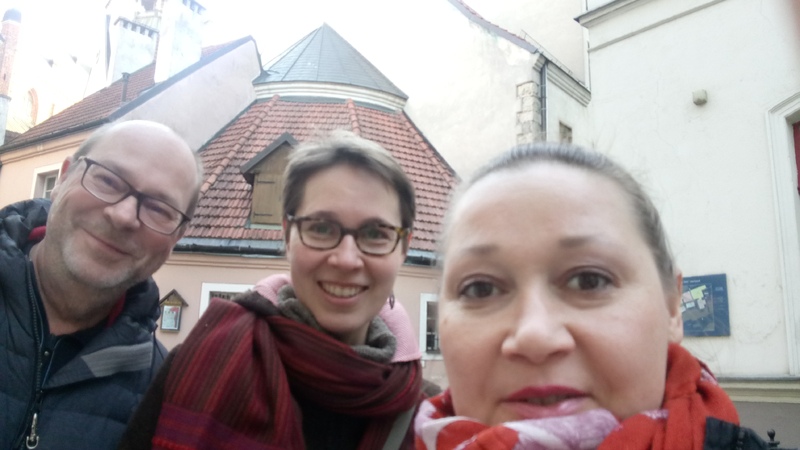 On the first day we also heard two talks on dative replacement, the other by Joanne Stolk, our partner from the University of Oslo who will also visit us soon in Helsinki (stay tuned!). Sonja Dahlgren and Martti Leiwo presented in the afternoon session on the second day. Sonja spoke about ”Outcome of longterm language contact: towards a definition of an Egyptian Greek variant”, a topic related to her forthcoming PhD. 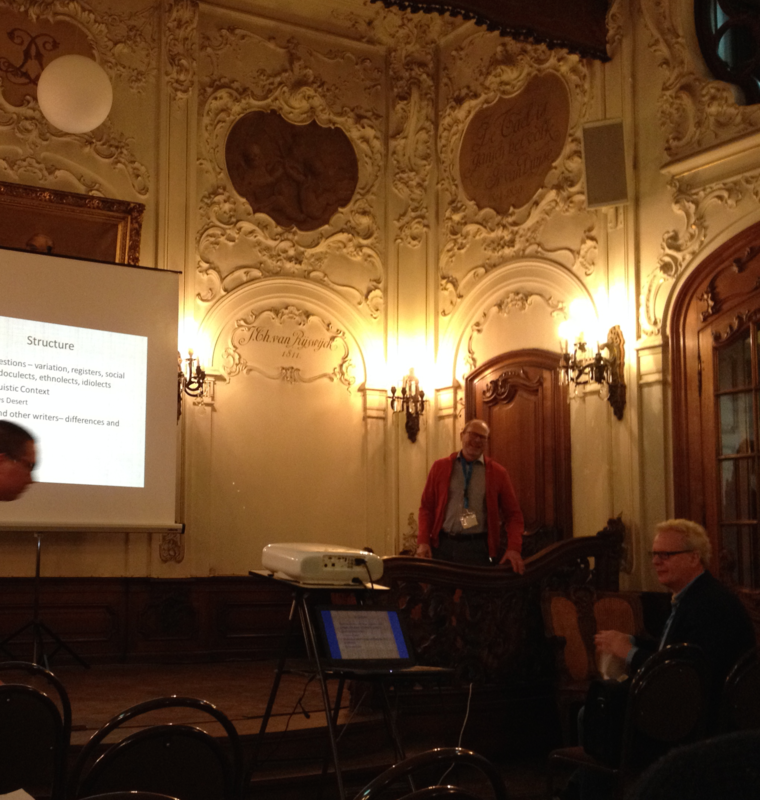 Martti presented some new examples on ”Direct speech in Greek private letters of Roman Egypt”. The conference was wrapped up by noon the following day, and we had a couple of hours to enjoy Mainz, visit the shores of Rhine and imagining Caesar building bridges before heading back to Helsinki. Today we were invited for a coffee by the Center of Excellence “Changes in Sacred Texts and Traditions” (CSTT) at the Faculty of Theology. We presented the starting points of our project and we discussed what our projects have in common and how we can learn from each other. Future collaborations are so much easier when you have met people face-to-face. And when you approximately know what the other people in your university are studying. Questions like how to date some phonological changes (chronologically, not romantically!) and how to identify scribal hands and language were in the air. That is the kind of coffee talk we like. Thanks for inviting us over! Forgot to take photos, unfortunately.